1. Connect PLC with your PC by RSLinx lite. 2. 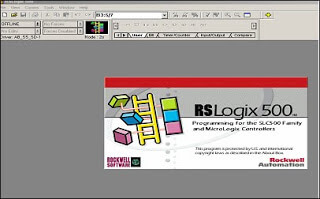 Open RSLogix500 PLC Programs and insert PLC Licence Disc. Note : System will show “Fatal Error” if don’t have Licence disc. 3. 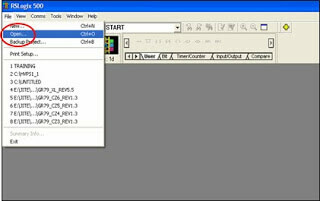 Open PLC Programs file by click File and open. 4. Select Comm at Toolbar and choose System Comm..
5. Switch PLC key to Program mode. 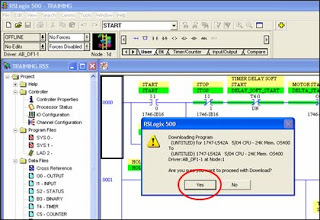 – You need to select Program mode when Upload and Download PLC Programs. 6. Confirm Download by select Yes. SLC 5/03, SLC 5/04, or SLC 5/05 processor provides back-up power for RAM by replaceable lithium PLC Battery. This PLC Battery provides back-up for approximately 2 years.A BATT LED on the will alerts when the PLC Battery voltage was drop under a threshold level. Note : Please see PLC Battery warning in this pic. Will safety for your equipment, if replace the lithium PLC Battery follow these steps:1. Remove power from the SLC 500 power supply. Note : Do not remove the processor from the SLC 500 chassis until all power is removed from the SLC 500 power supply. 2. Remove the processor from the chassis by pressing the retainer clips at both the top and bottom of the module and slide it out. 3. Unplug the PLC Battery connector. 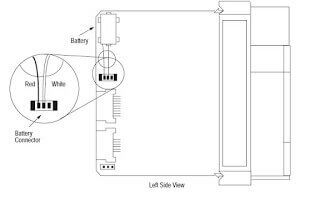 Refer to the figure below for PLC Battery connector location. Note : PLC Battery can back up Data in RAM at least 30 minutes. 4. Remove the PLC Battery from the retaining clips. 5. 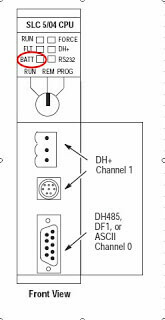 Insert a new PLC Battery into the PLC Battery retaining clips. 6. Plug the PLC Battery connector into the socket. 7. Re-insert the module into the SLC 500 chassis. 8. Restore power to the SLC 500 power supply. What is Process Control ?